off for the Cardinals, second baseman, Skip Schumaker! Opening Day 2009. Or, ever. Least of all, Skip Schumaker. niche, the skill that differentiated him from the pack and would earn him a roster spot and keep him in the lineup. of Rick Ankiel, Chris Duncan and Colby Rasmus. left-handed pitching, only hitting .168.
he had to work on was hitting lefties. or six serious contenders for three spots. that might find themselves back in Memphis. outfield and turns his gaze toward second base. second, maybe we could bring an infielder in. college, but there is a good reason he is an outfielder. perhaps this is why LaRussa chose Schumaker to make the transition. that are the most productive and competent. work, of course, because we know they can do it. dangerously into the path of the baserunner. Schumaker has a good outfield arm. have a Gold Glover at first base with great range to pick him up. its wrath on the next town over. conversion from a pitcher to an outfielder. month, I can only imagine what he might be in a year. Photo Credit: Skip Schumaker preparing for a game against the Astros in 2008 by me. Ah, spring! A time of hope and renewal, where anything is possible and the sky is the limit. So much good news has filtered out of the St. Louis Cardinals camp in Jupiter, Florida! Adam Wainwright looked good in live batting practices. So, did a HEALTHY Chris Carpenter. Of course, when pitchers look too good in live BP, I worry that there’s something wrong with our hitting. It’s only the first week, so maybe, I worry too much. The Cardinals also made it through the first week without a player logging a season ending injury. Woo-hoo! The two pitchers (Mitchell Boggs and Matthew Scherer) that experienced soreness early in the week are healing nicely. Two former redbirds have roosted in the Tampa Bay Rays camp: Adam Kennedy and Jason Isringhausen. If the Rays repeat this year, they may both look at their last rocky days in St. Louis as a blessing in disguise. Seeing Izzy not in a Cardinals uniform is beyond weird. As the all-time Cardinals saves leader, he has earned his place in Cardinals history. It is “unfortunate” (a word Tony LaRussa used) that Izzy could not finish his career with a strong year in St. Louis. Joel Pineiro did pitch well in the 2006 WBC (2.08 ERA, 4 BB, 5 K’s, 8.2 IP). So, perhaps there is another reason. The manner in which Pineiro took the news, venting his displeasure to reporters, claiming he was “disrespected”, and giving in to his emotions made me wonder if Oquendo’s pick had more to do with temperament than performance. Pineiro is an emotional player, and when things start to go badly in a game, his emotions can get in the way. Or, perhaps it was Pineiro’s mindset. Maybe because he and Oquendo are teammates and he started in the in the 2006 WBC, he thought he was a lock for the rotation. He already purchased tickets for his family to the WBC. He thought Oquendo was joking when he first suggested that Pineiro would be in the bullpen rather than the rotation. Did Pineiro take too much for granted? Coaches typically do not appreciate players who assume too much. One of the few starts I got in all my years of playing basketball came when the coach overheard some of the starters use the word “indispensable” in regard to their value to the team. Of course, after about five minutes of my stinking up the court, they were in and I was back on the bench where I belonged. Still, we learned a valuable lesson. Work hard. Be ready. Assume nothing. In the end, it is Jose Oquendo’s team and his decision. Pineiro has every right to feel “disrespected” or disappointed or upset, but it is not cool to unleash those emotions outside the clubhouse and express your displeasure with your coach to the media. If he wants to be respected, then he should know that his comments made him look like a spoiled, petulant child rather than a man worthy of respect that he insists he is due. This would not have been a controversy at all, if Pineiro had spent some time in Bull Durham’s “Crash Davis School of Clichés”. 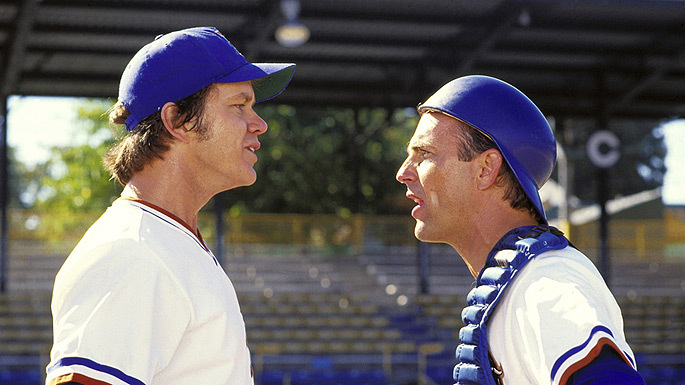 Crash Davis: I’m just happy to be here. Hope I can help the ballclub. I know. Write it down. I just want to give it my best shot and the good Lord willing, things will work out. Following Crash’s guidelines of “boring is good”, I tried to rework Pineiro’s statements. Boring Statement: “Oquendo said he had a spot for me in the bullpen, but not as a starter. If I went as a starter, I could prepare for the season the same as I would here. Unfortunately, I can’t do that pitching out of the bullpen, so I made the tough decision to stay here, work hard and be ready to go in April. I am disappointed that I will not be representing my country in the WBC, but Puerto Rico has other great pitchers to take my place. And, I’m happy to be here. I hope I can help the ballclub. I want to give this season my best shot and the good Lord willing, things will work out. Instead of playing in big games this spring, we’ll be playing in big games in October. Of course, if he said that, there would be no controversy, and what would I write about? This may all work out for the best for Pineiro. He was both injured last year and not particularly sharp. His hold on the fifth spot in the Cardinals rotation is tenuous at best. He should be hearing the footsteps of capable young arms gaining on him, ready to take his spot. In one of his statements he said, “I felt, I’m a veteran guy. I’ve been around long enough to know that I should be there representing my country. I deserve that respect. That’s the way I look at it.” A sense of entitlement, does not typically get one the respect they feel they deserve. Actions do. If he wins a dozen games, gets his ERA under 4.0 and learns how to control his emotions so he can pitch himself out of a jam, then he will have my respect, the respect of his teammates, and, I dare say, Oquendo’s too. Barring injuries, the only certain positions are Albert Pujols at first, Yadier Molina behind the plate and Khalil Greene at shortstop. Rick Ankiel and Ryan Ludwick will most likely find themselves some spot in the outfield on opening day, and Skip Schumaker will lead off somewhere. So much uncertainty means competition. Big time competition. The players know it, and they are there early to get any edge they can. Everybody in the running for 2B, 3B or an outfield spot is already in camp working out. No one is taking anything for granted. Many of the 2009 Major League teams will be defined by the free agent they signed or did not sign in the off-season. The 2009 Cardinals will be defined by the strength of their farm system, a system that has come through in the past. I like it. I like it a lot. Most fans would be more comfortable with fewer questions and more proven veterans, but I like the kids. The young, hungry, talented kids with something to prove. The 25 men on the opening day roster will be young warriors. They will have earned their spot. They will know what it takes to win.